On April 28th I arrived at my first visit to Brown’s Ranch in McDowell Sonoran Preserve, my fifth hike and fourth hiking location since moving to Arizona a month prior. I was pleased that even though I arrived mentally and physically exhausted I was forcing myself to go out and explore some area parks, even though it meant getting up a while before sunrise. As soon as I stepped past the welcome center I was reminded that while I should be proud of all I had accomplished the past six months, my struggles had been minor compared to what many face every day. 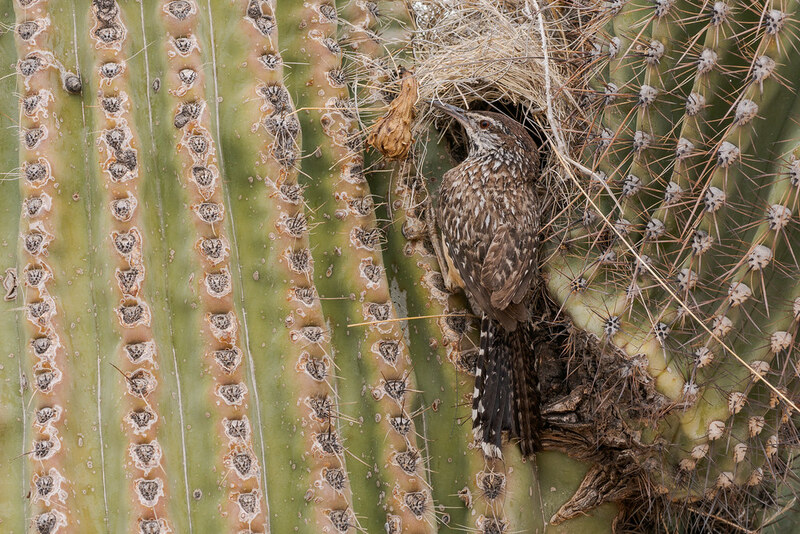 There in the arms of a saguaro, the light just cresting the distant hills, stood a cactus wren with a twig in its mouth, building a nest in such a seemingly inhospitable host in a seemingly inhospitable land. 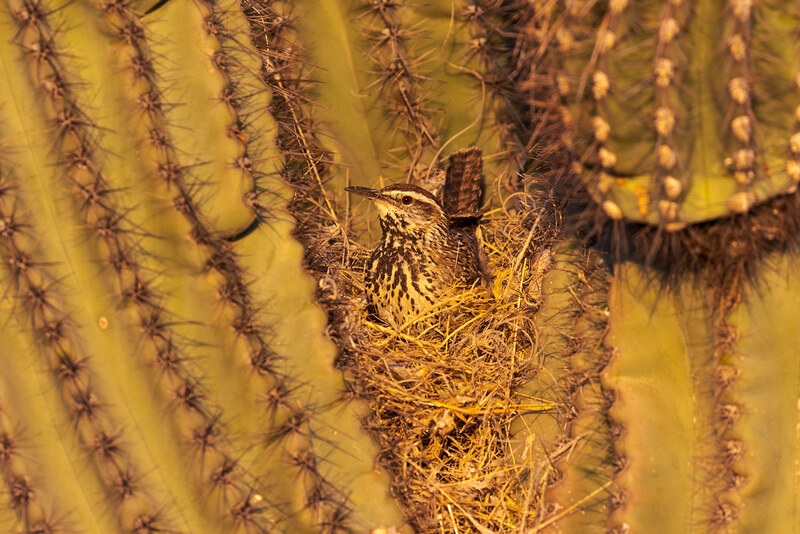 Brown’s Ranch became an immediate favorite as did the plucky wrens that in the coming weeks I got to watch not just build their nests but raise their families in them. 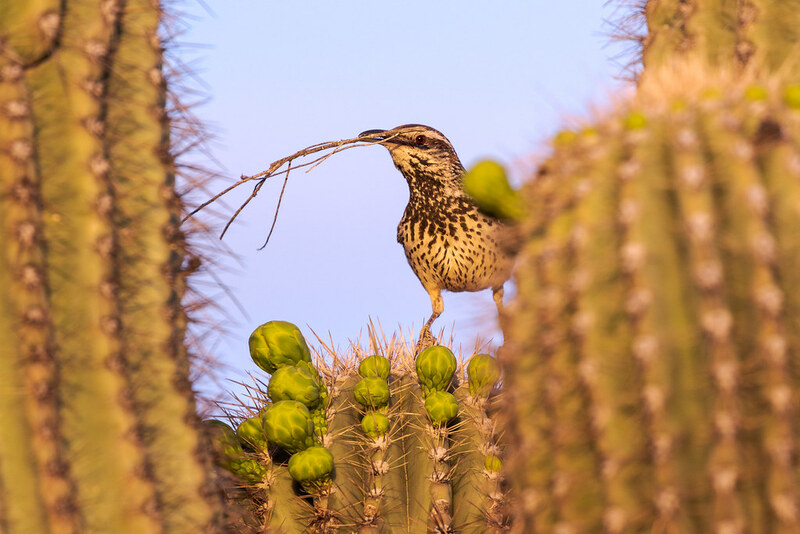 A black-tailed jackrabbit eats from a buckhorn cholla, one of the types of cactus commonly seen in the Sonoran Desert. I am amazed how effortlessly and silently mammals move through their home while I stumble down the trail. 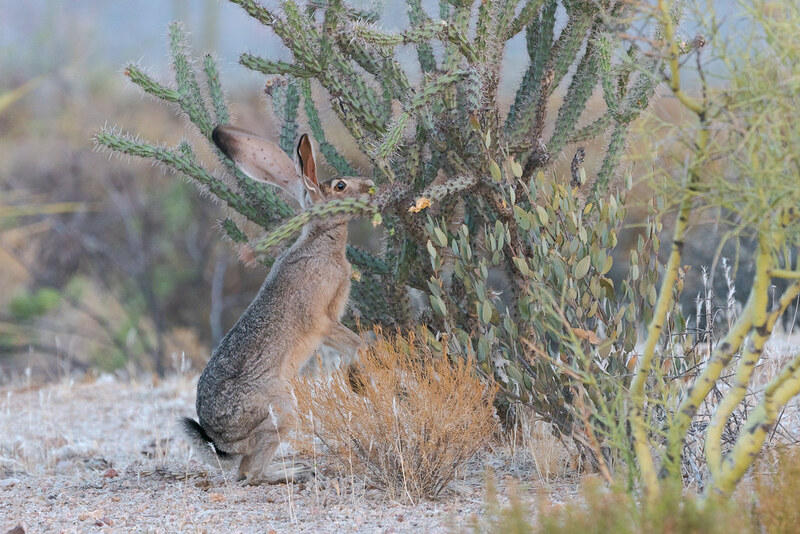 The jackrabbits seem like spirits floating through the desert, I often first notice the black tips of their tall ears moving while the rabbit itself is blocked from sight by the many plants of the scrubland. This lovely creature I found not on the trails but at the trailhead of Brown’s Ranch, we shared a quiet moment before sunup. 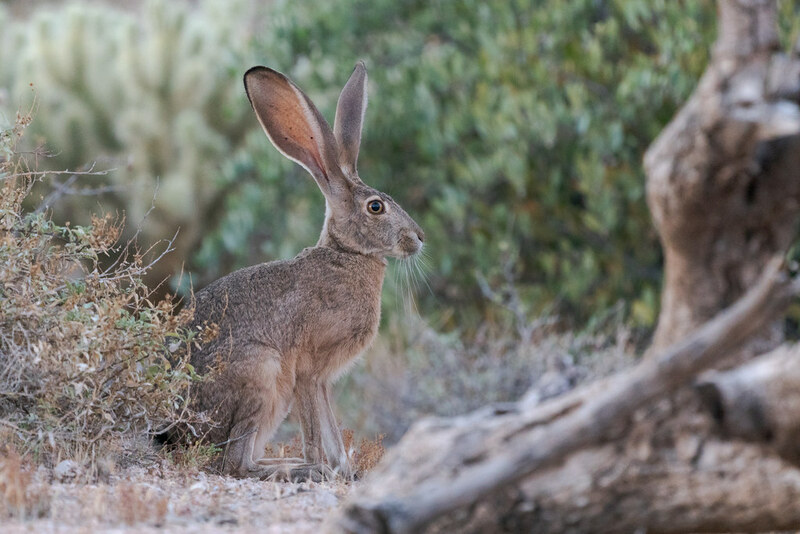 The rabbit you are most likely to see at the trailhead, and on the trail, is the desert cottontail (below). 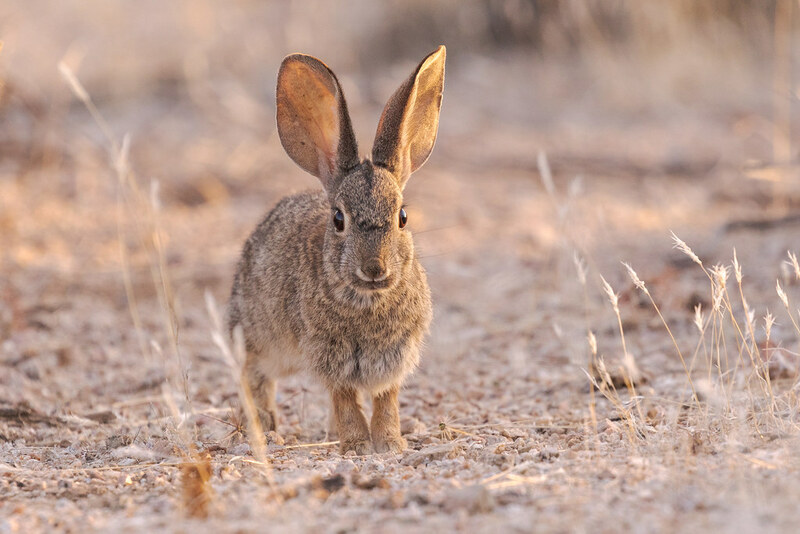 They too move silently through the desert but are so much smaller than the jackrabbits that you see them when you see them, there are no tall black tips dancing in the early light to catch your eye. Like all the mammals your best bet to see them is to arrive early, here also at the trailhead but just as the sun began peeking through to send one of us onto the trails and one to bed. Walking in the Sonoran Desert at sunrise, seeing the desert both wake up and go to sleep, is a joy and a treasure even to this lifelong night owl.